John is the founder and executive director of TNT Ministries, Inc. and an ordained minister for nearly three decades with Kingsway Fellowship International. He holds a Godan (5nd Dan) in Shorin Ryu and a Shodan (1st Dan) in Shiho Karano Ryu Ju-Jitsu. He is also a Certified Instructor in Krav Maga. John is also a Full Chaplain with the Martial Arts Chaplains Association. He serves as the President/CEO of the United States Martial Arts Hall of Fame and the International Martial Arts Council of America, and previously served as a regional director with the National Security Alliance. 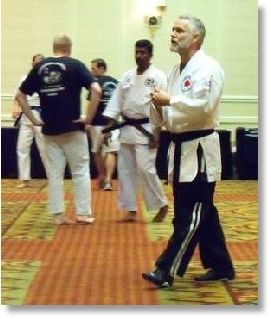 John was a 2008 inductee into the United States Martial Arts Hall of Fame for his “Kid-Safe” and “Women-Safe” advocacy work across the country. He has taught Kid-Safe programs to thousands of children in schools and camps, and is an “in demand” speaker on children’s and women’s safety issues. John is also a member of the National Crime Prevention Council and Crime Prevention Council of America. John was also honored with his Menkyo (Professorship) in Self Defense Studies by the Nippon Martial Arts Renmei in 2011 and was inducted into the Master’s Hall of Fame in 2016. He received an honorary instructor certification in the IMB Academy under Grandmaster Richard Bustillo, as a second generation JKD instructor under Bruce Lee in at the 2016 United States Martial Arts Hall of Fame, where he also took the reigns as President and CEO of both the United States Martial Arts Hall of Fame and International Martial Arts Council of America from the organization’s founder, Professor Marty Cale. As CMAC founder, chaplain and executive director, John provides administrative and spiritual oversight to CMAC and its members. 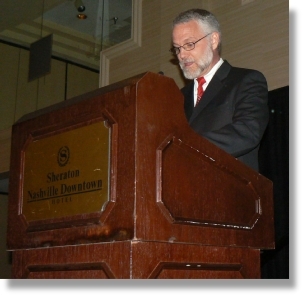 He is currently serving as Executive Director of TNT Ministries, in Hot Springs AR. John is also a concealed carry instructor in Arkansas and teaches Israeli Combat Shooting.